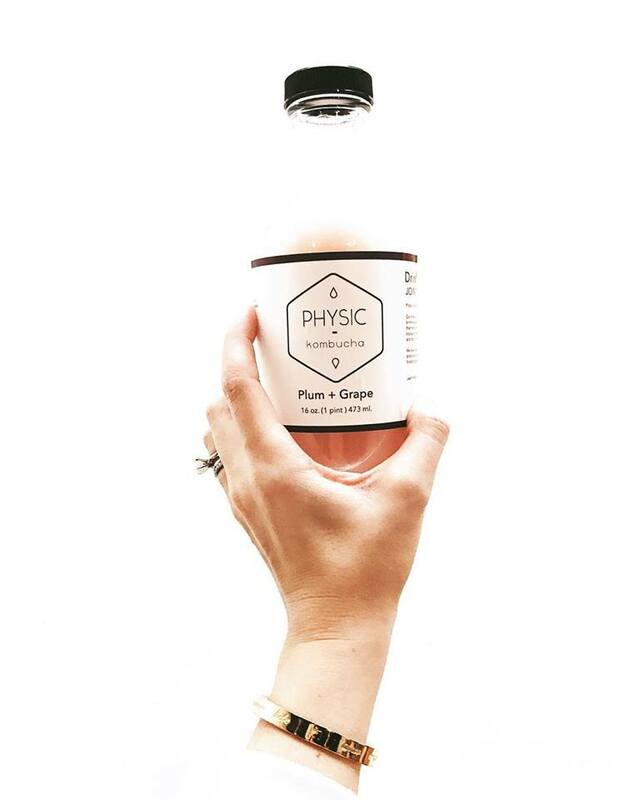 Deep within Portage’s Bakewell community kitchen, the wellness duo known locally as Physic Kombucha are busy at work. With large 30 gallon fermentation drums in front of me, I’m curious to see the process behind the probiotic beverage. Co owners Meredith and Danielle come from various health backgrounds. Meredith is an exercise specialist, with an eye for cold pressed juicing. Danielle is a registered dietitian and nutritionist and promotes brewing kombucha for gastrointestinal health. Together, the processing and flavor pairing come together to make an exceptional beverage. Flavor combinations like plum and grape, pineapple coconut, and my personal favorite, pomegranate and rose hip are available now. Kalamazoo is known for its multitude of craft brewing creativity, these two aim to put kombucha in the spotlight as the next big beverage. Missy (Handmade Kalamazoo) outdid herself with our labels. She helped guide us into the branding of PHYSIC and geared us in the right creative direction. She brought a great energy into the design production and was amazing at answering our 100 emails! A local design team, Olive + Knut immediately embraced our vision of a sharp, clean logo. They produced a core component of PHYSIC and were amazing to work with! What was the initial decision to take your strong suits (cold pressed juices and kombucha) to a business level? I (Meredith) was already in the process of starting a juice company when I approached Danielle to join in. She was already making kombucha and had a growing interest in selling it to individuals. We both saw a need in the community of Kalamazoo and decided to officially join forces to make kombucha flavored with cold-pressed juice! There is nothing like our beverage in Kalamazoo and we are excited to share it with the community. Is there anything you want us to know as a consumer about the benefits of kombucha? The health benefits of kombucha are never ending. Seriously. Some individuals consume kombucha to improve gut digestion, some take it to boost their immune system. I enjoy kombucha because I notice increased energy throughout the day. Other health benefits include increased healthy gut bacteria and detoxification. Are there any future plans for new flavors or seasonal beverages? We would love to offer a seasonal flavor used from local Michigan fruits such as blueberry mint, cherry lime, or a spiced apple. We will see how our initial flavors sell at the market and if people will be interested in another flavor.